Yes, everything you do online is being tracked. Your searches, the videos you watch, transactions, social events, even crime. Scandalous crimes. With a little help, especially with our guides, you’re still able to remain anonymous on the Internet. But understanding how you’re being tracked is an important lesson, as are the little things you can do to maintain your privacy. 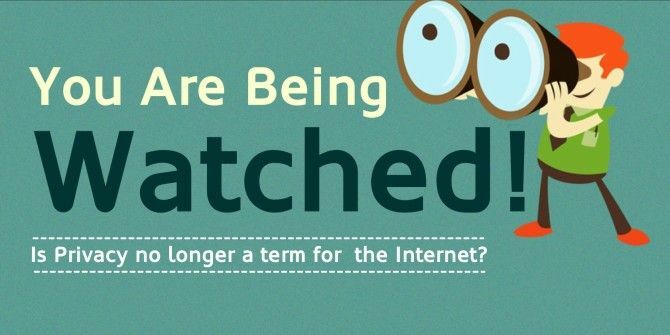 Explore more about: Infographic, Online Privacy. Does disabling flash mean that you can't watch Youtube anymore? I thought it was only Paedophiles that would be interested for this type of information.Why would you want to help them? I never understood that paranoid people who freak out from the though that they are being watched online. Big freaking deal! What do you have to hide so badly? If you are so concerned about your privacy you probably SHOULD be followed because you are probably involved in some illegal stuff. The rest of us "ordinary", law keeping citizens of the globe would have to live with the fact that robots (not people, just robots) will monitor our habits in order to serve us ads which may actually interest or help us instead of just showing us random crap we will never buy. So, a company should have access to the fact that you're searching for information regarding a personal matter, perhaps a medical one? The government should have the ability to track your exact location at any time? Is that what you think is a good idea. Personally, I value my privacy. Sure, I use Facebook, but that's my CHOICE. I shouldn't be forced to reveal all of my personal information to a company at all, and I shouldn't have to give any information to the government unless I'm suspected of a crime. That's part of the founding principles of the United States, and one of the reasons the US seceded from the United Kingdom. Since you're feeling so helpful, why don't you post the details of your bank account, your home address, and what time you and your family leave your house, since you "aren't doing anything wrong." If a certain software can detect I have a certain illness and as a result can show me a proper ad to a medicine that can solve my illness then by all means! I'm curious to know in what scenario exactly were you forced to give a sensitive information about yourself to the government? Again, that sounds like an old school paranoia to me. What's wrong with giving my bank account details? I already give them to anyone that needs to pay me for my work. And a lot of houses are ALREADY getting robbed because people brag on social networks that they are going on vacation. That has nothing to do with privacy or the government. Just naivety and opportunist assholes. In conclusion, there isn't any privacy problem with the internet - the only problem is people that over share information and they are the only one to blame for it. "Is privacy no longer a term for the Internet?" It never was! Knowledge is power and data is money. Is the purpose of this "article" only to link to another one? Or Ghostery & adblock plus combo. Don't use Make Use Of. These are standard non-identifiable trackers that either help us understand how people use our website or serve contextually relevant ads. Nothing out of ordinary. OK, Aibek. Now I understand. If other sites use the same trackers, that is BAD, but when MUO uses them, it is only to better serve its users. I bet every site justifies tracking users the same way "We only do it to better serve our users." No matter how you slice it, dice it, spin it or justify it, tracking is tracking. I think you may be over-reaching here. Yes, there's some form of tracking, but it's for on-site activity evaluation. We don't track user browsing history, sell tracking information or personal information. We're not saying all forms of tracking are bad, but users should be aware that there are some dodginess out there. Surely you don't think MakeUseOf falls in the same category? I disagree. I am not familiar with all the scripts that are likely to be found on popular sites these days but for the most part sites like MakeUseOf use analytics services to understand how people engage with the website. I am not saying that none of the sites doing anything more than that but it's definitely not a widespread practice. Most of the so called tracking scripts like the ones outlined above used either to track website visitor stats (Google Analytics, CrazyEgg etc) or serve contextually relevant ads (Google Adsense, Viglink etc) to the user. We may use a service like Google Analytics to see where people are clicking or the amount of time they spent on the website when browsing our website but at the same time not able to identify user specifically and retrieve anything about the user other than his/her IP address. Let's you create new cookie isolated tabs.